Curved Single Stringer stairs have the most floating design of any stair with a visible support system. These modern and contemporary metal staircases are available with nearly any type of tread & handrail style. The curved single stringer is the support structure under the treads, so it is often created out of very heavy and large profile structural steel. The creates a very strong and precisely fabricated system. Since the curved staircase is fabricated this way it is not as easy to ship. Although the stair is very heavy, it is fairly easy to install as long as you or your contractor have the ability to lift it into place. The average curved single stringer will weigh between 600 to 900 lbs before the wood steps and handrail are applied. 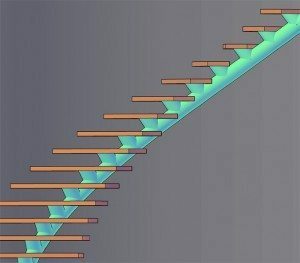 These stairs have heavy-duty center beams that make the stair capable of handling 300 lbs per tread, and can go up nearly any height. These single stringer curved stairs can be made with almost any configuration. 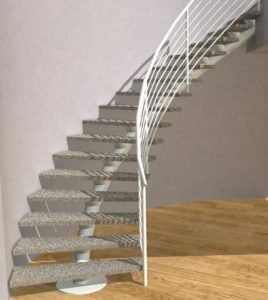 We can make these stairs to have a very slight bend with a huge outer radius, or these stairs can be made in a tight curve with an outer radius as low a 3 ft, and an inner radius of just a few inches! Our curved stairs can rotate just a few degrees, or can rotate a full 360 degrees, depending upon the height and outer diameter. We can even combine these stairs with straight staircases or spiral stairs! This rendering of the curved single stringer shows a 6″ round tube as the support structure. The riser supports are also 6″ tubes. A 3/8″ thick steel plate is welded to each riser support. The tread plates are pre-drilled with counter sunk holes so that the wooden treads can attach from the underside. All kinds of tread & railing styles are available. We also offer riser space limiters! This is a rendering of one of our modern or contemporary steel staircase designs. The single stringer gives a very modern open look. The steel structure is precise & strong enough for glass or stone treads.